A whole month of training has gone by since I have last blogged, and I feel like a heck of a lot has happened in just four short weeks…Training has been filled with highs and lows, and I mean this literally – I’ve run at 8,000 plus altitude and all the way down at sea level. Of course, there’s been swings in my confidence as well. I failed to complete a four-mile time trial, quitting just after two miles. But then I’ve surprised myself and nailed a few fast workouts that have both boosted my confidence and provided feedback that lets me know the training is working its magic. As far as injuries go, perhaps my biggest struggle right now is with the plantar fasciitis in my left heel. The issue is nothing new – Unfortunately it all started about a year ago when I took some not-so-great advice from a physical therapist that told me I should start doing all my exercises barefoot in order to strengthen my feet (which felt fine at the time). But you live and learn about believing everything the doc orders. (This PT also watched me run and instructed that I should work on increasing my cadence…I went as far as finding my old metronome from my childhood days of piano lessons before I got a new Garmin that told me I was already running at well over 180 steps per minute.) In the meantime, I got a real pain in the heel. A while back I spent countless hours researching plantar fasciitis, and I’ve wasted quite-a-few co-pays at the podiatrist’s office. I’d love to hear if anyone has found something that works for them! Personally, I think there is no quick or easy cure. If you get plantar fasciitis, Congratulations. You are now screwed screwed screwed. I think the best you can do is to try to deal with it and let it ride its course. And by deal with it, I ice, stretch, massage my calf muscles, wear my orthotics, and occasionally pop an Alieve (shameful I know). In a couple of years, it’ll probably be gone. Fortunately, my plantar fasciitis wasn’t bothering more than usual when I got to spend a long, humidity-free weekend in Colorado recently. 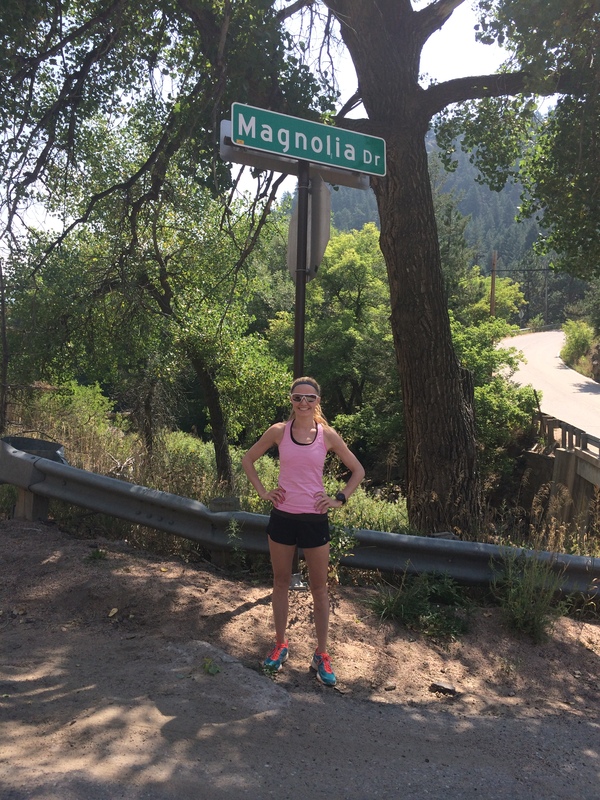 I put in a total of four runs at elevation with my highest and longest run on the famed Magnolia Road just outside of Boulder. After finishing my long run further up the road where it’s unpaved. I had been warned about running at elevation and the dangers of getting in to oxygen deficit. I also remembered Desiree Linden once saying in an interview something to the effect of “You’ve got to put your ego aside when running at elevation.” Thus, I had some respect for the altitude and was very conservative in my long-run pace on the rolling Magnolia Road, backing way off while running uphill. Perhaps because of this conservative effort or (as I somewhat suspect) because the heat and humidity of North Carolina can be just as demanding as elevation training, I honestly couldn’t tell a difference running up there. Maybe if I did some workouts in the Colorado mountains or didn’t just come from the land of crazy sweaty, soup-like weather, I would have felt more of an impact of the altitude. While I got fair notice of the altitude, here’s what people didn’t warn me about while running Magnolia Road….First, mountain lions. Seriously. I was only a few miles in when one of the few other runners on the road, passed me coming from the opposite direction and started shouting warnings of a mountain lion a few miles up the dirt road. There was definitely a part of me that was wondering if this dude was just messing with me, but after turning around early and meeting my friend and a few other runners back at the car, I realized this guy was for real – He was alerting everyone he saw of the beast. The second word of caution I have for people (OK – mostly the females) who venture up to run Mags is to make sure you hit up a bathroom in Boulder because there is nothing up Magnolia Road. I would have thought that as famous a running spot as Magnolia Road is, there would certainly at least be a port-a-potty up there…But nope. If you expect a toilet at Mags, you may find yourself literally sh*t out of luck. Jokes and mountain lions aside, running and visiting Colorado was an amazing experience! Boulder felt a bit like a runner’s motherland, Denver had amazingly architecture, and the entire state is filled with breathtaking views. I can’t wait to go back. Maybe next time I’ll stay long enough to reap some benefits from that altitude training. 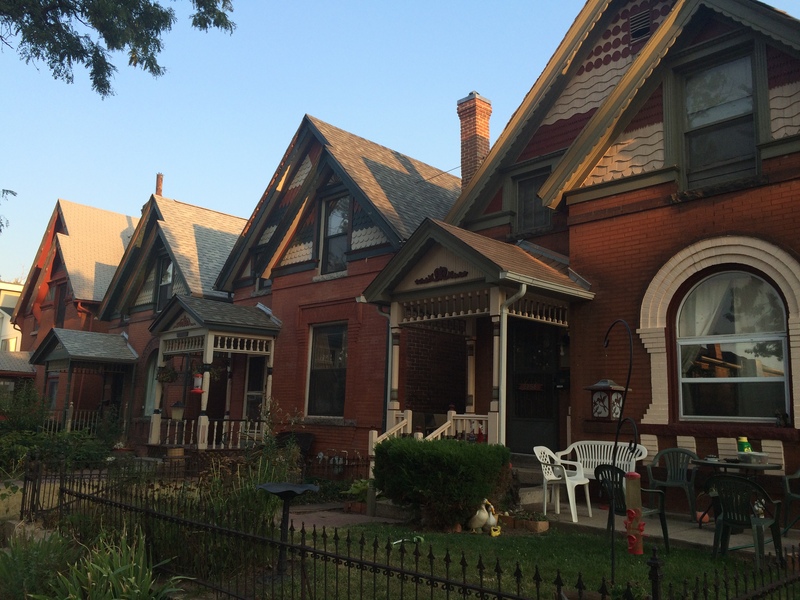 So many neat, old houses in Denver! Take me with you the next time you go! I’ve never visited Denver! Love seeing all the high miles you’re putting in! yay! I’ve never dealt with plantar fasciitis, fingers crossed I never do, because it sounds like a total b!tch!